We are proud to say that here at Montano Concrete we have the expertise and education to handle all areas of concrete. From miles of sidewalks, dams, and bridges to pouring a custom family patio or swimming pool, we will work with you on your specific project. It will stand the test of time and you’ll be satisfied with for years to come. We specialize in five particular areas of concrete: civil projects, commercial flatwork, heavy highway structures, industrial foundation, and small residential flatwork and foundations. At Montano Concrete our experts always strive to produce high quality, timely services for the public and private sectors. Montano Concrete is fortunate to have such a dedicated, hard-working team, most of whom have been with the company for many years. One of our favorite things to hear from clients is how impressed they are with how well our team works together. Our teams’ professional dynamic, skills, and diligence produce a quality job in an efficient and timely manner. 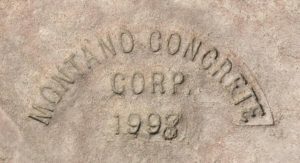 Montano Concrete was incorporated by Dan Montano in 1982, but the business has been based out of the Pueblo area for much longer. Montano Concrete began serving southern Colorado in 1970 in all aspects of concrete construction. You may even have seen our stamp pressed into the sidewalks around your community. In 1992, Dave joined his brother, Dan, and showcased structural concrete, continuing to expand and promote the business. In fact, our clients can find us in the same office building in Pueblo where the business began over forty-five years ago. We serve all aspects of concrete construction including heavy industrial, commercial, and residential flatwork and foundation. Contact us today to tell us more about your project!